When Summer gives way to Fall, all of a sudden we find ourselves looking for ways to keep busy indoors instead of outdoors. It seems the older I get the more I like the idea of hunkering down in the quiet comfort of my home. Let's Review some ways to make this time productive and fun! Looking back over the last few months I realize that I did not want to come indoors at all. Summer was glorious this year, with warm sunny days and warm evenings too! Alas, all good things must come to an end, especially when you live in the north! Fall is a great time to get cracking on all those things you wanted to do but didn't. Fall is also that gateway to all kinds of Holidays that require your time and talents. It's a wonderful time to try your hand at making something crafty too. Decorating your space was never easier, with themes provided by the Holidays. So to that end, we will start getting all our crafts in order! Or we will try something new! Crafting gives our hands a chance to make something unique and beautiful. It lets us express some of our hidden talents. We see something we like and we just know that we could do that too! So when we are indoors instead of running around outside, we can sit and give our hands a chance to make something that we have never done before. Halloween and Thanksgiving are great times to try our hands at crafty ideas. We could start by making special goodie bags for the children that visit our door on Halloween night. If you have a little more time, maybe we could make something a little more personalized for our family who will visit during Thanksgiving. Both of these holidays can launch us onto a new hobby. 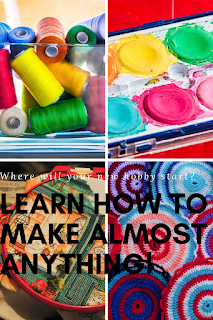 Now unless you are reviving a hobby that you once invested in, I would not suggest that you go all out and purchase all the items you might be needing for a new hobby. Head to your nearest Dollar Tree! 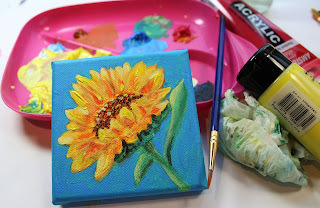 It's a great place to start a new hobby and you can do it on-line. You just never know what you will find there that will twig an idea! There are hundreds of items available that you might be able to use to fuel your creative genius. From yarns, to paints, beads, canvases and findings, you know you will have a great time picking out the things that will be transformed under your hands. Don't spend a lot of money on a craft or hobby until you are sure it is something that you will continue to do. There are a great number of "How To" books that will walk you through all stages of a new hobby. 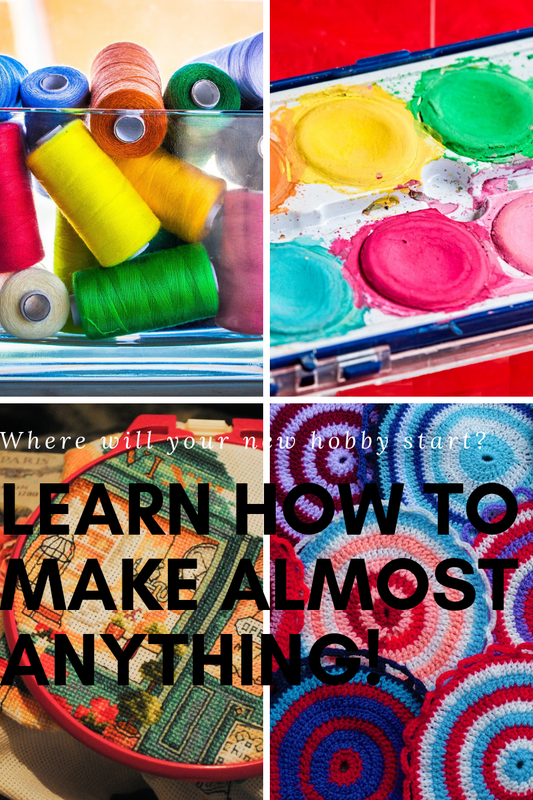 Knitting, crocheting, leatherwork, macrame, rug hooking, drawing and so many more hobbies can be learned through the pages of a great How To book! I've chosen just a few to get you started. There are also many You Tube videos that will give you a "working" look at how to make some things. I guess what I'm saying is that your indoor time during these upcoming cold months can be productive and fun. You just might find that you have a talent for a certain hobby. I have several writer friends right here on the REVIEW THIS team, that are so talented they have their own ETSY shops, where they turn their hobbies into a small business. All the contributors here are passionate about some form of hobby! Greeting Cards, knitting, crocheting, photography it's all covered by our contributors. If you don't feel inclined to make things yourself, I would suggest that shopping at the Etsy Mall will help you find something beautiful, hand made and will help to support someone who is working hard to make things beautiful.